As you know, Google began rolling out Penguin 4.0 on September 23rd - we've been writing about Penguin a lot recently so catch up here. But on the Tuesday after, we reported that there was minimal impact seen by anyone in the SEO community. We learned later, on Wednesday, that the Penguin penalty reversals started rolling out Wednesday and for the next few days. Some have started chiming in that they saw the reversals and recoveries. 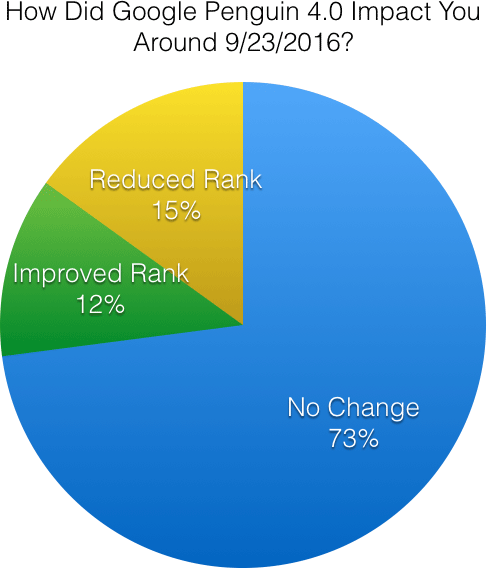 I ran a poll on Tuesday asking if folks saw any changes to their rankings specifically around the September 23rd date. We had almost 600 people respond to the poll and 73% said they saw no changes, only 12% said they saw an improvement and 15% said they saw a drop in their rankings. It sounds right, but I suspect many more will change their minds this week.